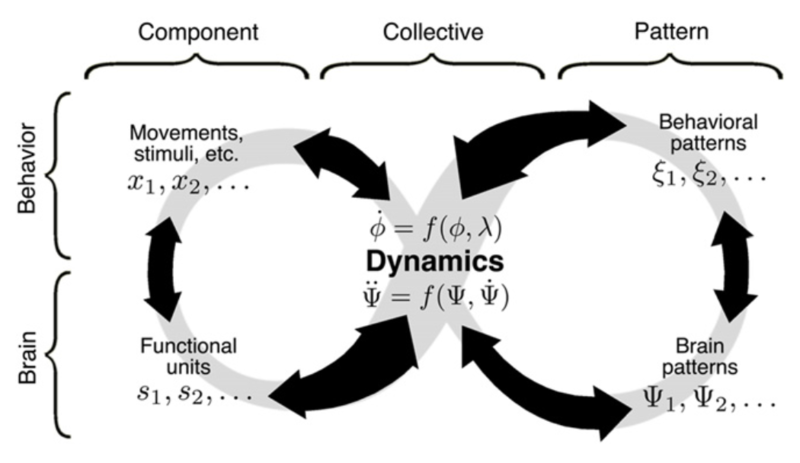 Much evidence suggests that dynamic laws of neurobehavioral coordination are sui generis: they deal with collective properties that are repeatable from one system to another and emerge from microscopic dynamics but may not (even in principle) be deducible from them. Nevertheless, it is useful to try to understand the relationship between different levels while all the time respecting the autonomy of each. We report a program of research that uses the theoretical concepts of coordination dynamics and quantitative measurements of simple, well-defined experimental model systems to explicitly relate neural and behavioral levels of description in human beings. Our approach is both top-down and bottom-up and aims at ending up in the same place: top-down to derive behavioral patterns from neural fields, and bottom-up to generate neural field patterns from bidirectional coupling between astrocytes and neurons. Much progress can be made by recognizing that the two approaches–reductionism and emergentism–are complementary. A key to understanding is to couch the coordination of very different things–from molecules to thoughts–in the common language of coordination dynamics.